The Protestant Reformation, begun with Martin Luther's posting of The Ninety-Five Theses in 1517, rapidly escalated into an evangelical reform movement that transformed European Christianity. Less than a decade later, a massive rebellion of German commoners challenged the social and political order in what would prove to be the greatest popular rebellion in European history until the French Revolution. 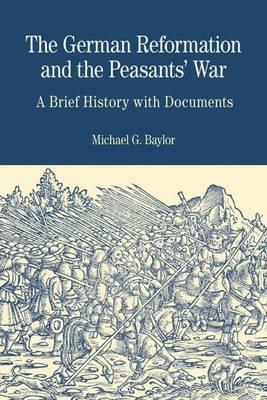 In this volume, Michael Baylor explores the relationship between these two momentous upheavals - one enduring, the other fleeting - and the centuries-long debate over whether and how they might be connected. A collection of period documents offer first-hand accounts from the reformers, rebels, and the institutions they sought to topple. PARTI: INTRODUCTION: GERMANY'S DUAL REBELLIONS Popular Discontent and the Need for Reform.- The Reformation Break.- The Gospel and Social Unrest.- The Reformation in City and Countryside.- The Onset and Spread of the Peasants' War, 1524-1526.- The Aims of the Insurrection.- The Peasants' Military and Political Organization.- Luther, the Peasants' Defeat, and the Aftermath of the Rebellion.- PART II: THE DOCUMENTS Unrest Before the Reformation.- The Reformation: Freedom, Authority, and Resistance.- Religion and Politics in the Peasants' War.- The Debate on the Reformation and the Peasants' War. MICHAEL G. BAYLOR Professor of History at Lehigh University, USA, where he specializes in the history of early modern Europe and the social and cultural history of Germany at the time of the Reformation.